I’ve always been a fan of engine dampers. Not only do they look good in the bay, they recover wasted engine motion and covert it into forward momentum. Here’s a new one for the 350Z by STILLEN. When an engine moves excessively in its mounts, energy is wasted. Stillen’s engine stabilizer converts this wasted motion into forward momentum. An isolastic mount acts as a shock absorber and dampens unwanted motion. With no hydraulic parts to wear or fade in use, this is a long term solution. Easy mounting uses existing holes and complete instructions are provided. 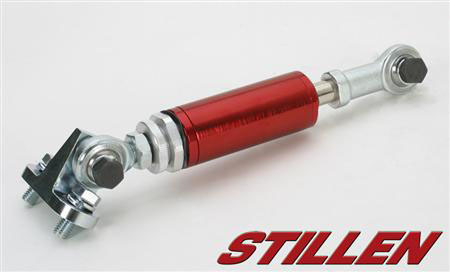 The STILLEN Engine Damper Brace for the new VQ35HR 350Z engine have been released, and are available for shipping. These braces dampen the engine’s torque, recovering wasted motion into forward momentum. These are a similar design to the already available Engine Damper Braces for the previous 350Z, G35, and 300ZX Nissan/Infiniti models. Care and detail were taken in the manufacturing and design of this brace, and subsequently cost was reduced, reducing the final price on these.